Great news for Cebu techie and internet addict travelers! 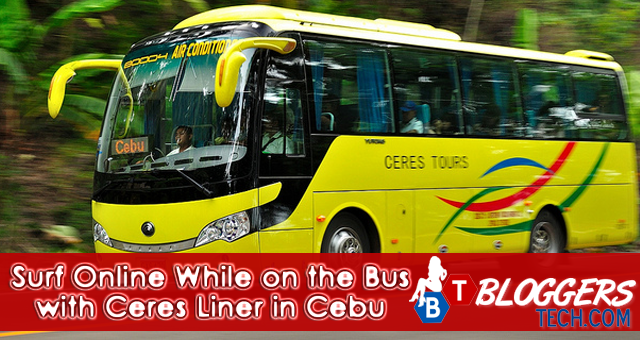 You can now surf and entertain yourself online while on the bus with the Ceres Liner FREE Wi-Fi access. Not all of their buses are already equipped with an internet access, there are only 41 buses out of 253 buses that they have now. Hopefully, they'll have this in all their buses so that everyone could enjoy their travel and at the same time get to be connected online. I've heard that Manila already have this but they said it's quiet slow, still you get to go online and get socialize with your family, friends, fans and followers through social media. For me and my fellow Cebu bloggers or let's just say all bloggers, this is a great service since we can write blog post along the way, take live shots or live webcast while on the bus and help us finish our tasks and reach the success in our blogging career. This is actually a great way to market their business and services, at the same time attract more customers to ride on their bus since a lot of people these days go online to either check their online accounts or update their social accounts on where and what they're currently doing. This means, their business gets a free advertisement and exposure right from their bus passengers through tweeting where they are or sharing a photo they have while they’re on the bus – which is totally a method that has a high chance in smashing the competition. It's a great investment and additional service added by the company. They may have not thought of what I have stated above, but think about it - it is just right, right? Some says the internet speed is too slow for them, well I say that depends on what you’re doing in consuming the speed. If you’re watching live streaming, YouTube videos or just tweeting, which obviously consumes and requires different speed if you want the videos or live streaming to continuously play then of course how many people are using the internet. The Ceres bus is equipped with 3.5 mbps internet speed, which they say is enough to serve 45 passengers on the bus. My internet connection on my place (where usually I am the only one who’s using it) is 1mbps and I could already download huge files in just few minutes, watch an hour length videos or even movies, etc. So the question is, is the internet speed stable? Is it not intermittent? I’ve also heard that the router is using a battery, so if the travel takes hours there’s a possibility that you can’t access the internet anymore. Not because there’s no internet access, but because of the battery life of the router. Anyway, according to the current manager of the Ceres bus they’re trying to find ways to prolong the life of the battery improve their service and provide the needs of their passengers. Internet access on the bus may already exist in your country but this is a must share news for me since I used to travel since 1990’s with my parents with at least 1 hour long drive and usually 3 hours’ drive. Internet has also limited access way back then and very expensive so having access at a free of charge is a total plus for me. Cebu is definitely becoming more and more advance. With its tourism, business opportunities, technology, skilled Cebuano – surely there’s more to expect and witness from Cebu and I’ll surely be sharing it with everyone here in Bloggers Tech. All About the Mommies 12K Fans $75 Giveaway!